Chiropractors can treat sports injuries of both the spine and extremities. Extremities simply refer to any joints of the body besides the joints of the spine such as the ribs, elbows, shoulders, wrists, knees, fingers etc. Often times, injuries result in joints that are not moving properly. Restoring proper motion into these joints allows for the surrounding soft tissue to heal properly. Rehabilitation of the affected joints and soft tissue are often necessary to ensure the injured area is less likely to become re-injured. 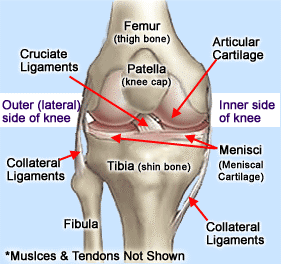 The knee is a hinge joint that is made up of the femur, the tibia, and the patella (knee cap). It is a synovial joint meaning there is a joint capsule that contains fluid called synovial fluid. The synovial fluid nourishes and lubricates the joint. This blog is the first of a series of blogs discussing the basic anatomy and injuries to different parts of the knee joint. BURSA: A bursa is a fluid-filled sac that is located in the body in areas of high friction. The knee has a large bursa above the patella, a few small ones behind the knee, a few in front of the knee, and others that are sometimes present. CARTILAGE: There are two types of cartilage in the knee: fibrous and hyaline. Hyaline cartilage covers the surface of bone along which the joints move. Fibrous cartilage (also called the meniscus in the knee) is strong and helps to protect the bone and allows for pressure resistance. The menisci in the knee wear and tear over time and has limited ability for healing. LIGAMENTS: Ligaments are non-contracting tissues that connect two bones to each other. They help stabilizes the knee and limit movement. The knee has 5 main ligaments and a few smaller ones for stability: anterior cruciate ligament (ACL), posterior cruciate ligament (PCL), medial collateral ligament (MCL), lateral collateral ligament (LCL), patellar ligament, oblique popliteal ligament, and arcuate popliteal ligament. TENDONS/MUSCLES: Tendons are on the end of muscles where they connect muscle to bone. There are several muscles and tendons that cross the knee joint. Anytime a tendon/muscle crosses a joint, it plays a role in the movement of that joint. The more a joint moves, the more susceptible it is to getting injured. Knee injuries are just one of our specialties. Contact us at 253-927-0660 to learn more.